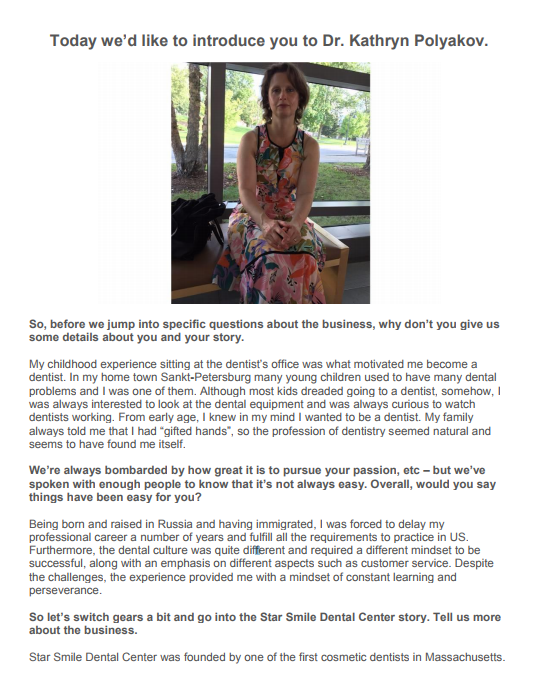 Star Smile Dental Center offers family dental care in Framingham, Massachusetts. Our dental practice dedicated to serving our patients with the highest level of quality and care. We provide full-service dental care using cutting edge technology and advanced materials with a gentle touch. At our general dentistry practice, we are focused on making a visit to the dentist office as pleasant as possible. Our laser-assisted procedures result in minimal recovery time, pain and chance of infection. We provide quality care with our dentist services for our patients and many different procedures that cover a variety of your dental needs. 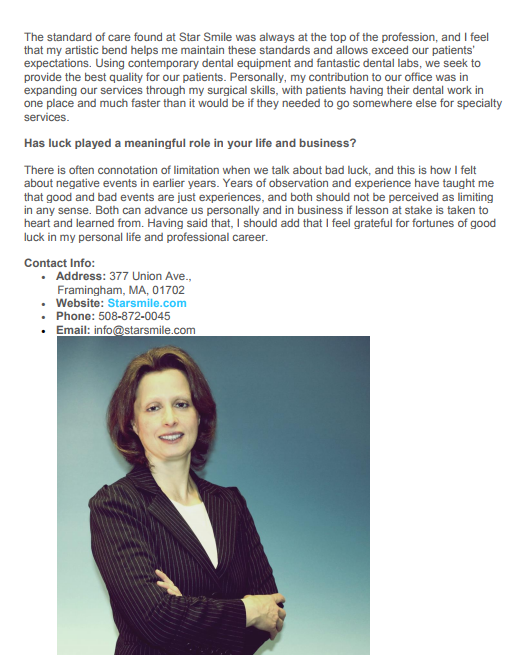 Dr. Kathryn Polyakov believes that the very best results for your dental care can be achieved by developing a long-term professional relationship, built on mutual trust and shared respect. At Star Smile Dental Center, we understand that you are looking for a dentist who will be able to fix the problem you have and create the beautiful smile you've always dreamed about. Family & General Dentistry, Cosmetic Dentistry/Smile Makeovers, Dental Implants, Dental Emergency Treatments, Laser Teeth And Gum Treatments, Dentures (Full & Partial), Implant Supported Dentures, Overdentures, All-On-4, Crowns & Bridges, Invisalign®, Bondings And Tooth Colored Fillings, Full Mouth Restoration, Porcelain Veneers & Lumineers, Porcelain Inlays, Onlays, Bad Breath Treatments, NTI - Tension Suppression Device (For TMJ Patients, Patients with Headaches), Preventive Dentistry, Oral Hygiene Services, Deep Cleanings, Periodontal Surgeries (Traditional or Laser) for Gum Disease, Cosmetic Gum Lifts For Gummy Smiles, Removal of Benign Oral Lesions, Snap-On Smile, Tooth Extraction/Wisdom teeth removal, Porcelain Crowns, Oral Surgery and Emergency Dentistry. Get excellent dental care in Framingham, MA. Star Smile Dental Center is a dental practice offering general and cosmetic dentistry services. Choose the dental practice at the forefront of the industry. We offer cutting-edge family dental care procedures, including laser treatments, for both general and cosmetic dentistry patients. Learn more about how to become one of our valued patients. We answer your most pressing questions about dental care so you can have a healthier, happier smile. Turn to us for reliable preventive dentistry solutions.